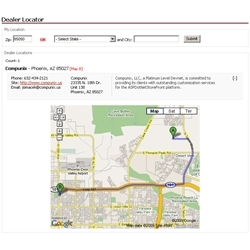 Use this handy Dealer/Distributor Locator for AspDotNetStorefront to help customers locate your dealers. See a demo of this add-on here and try 85050 as the zip. Response:Thank you, for 1) It's an XmlPackage for the output so this won't be an issue to change - find/replace 2) Same with above, it could be hidden 3) this can always be added as it uses the Google maps, but would be custom 4) hiding fields goes back to 1+2 so no worries there. With the upgrading, if we customize it for you, we can make it work on MSx cart as well when upgrading. - Detailed installation instructions included in the download.